Four years ago today, my little Sheltie made his way into this world. A little less than seven weeks later, he came home to live with Robert, Cotton, and me. He is my heart and soul! Cotton was a big white fluffy puppy – just gorgeous. Don’t shoot me, but I personally don’t think Sheltie pups are some of the cutest around. They are a breed, in my own opinion, that are much more gorgeous after they become adults. All pups are cute, but Barney and other Shelties are not beautiful as puppies. In my opinion! My mother came over shortly after I got Barney. By that time, his little looks had grown on me and I was thinking he was cuter than I did initially. 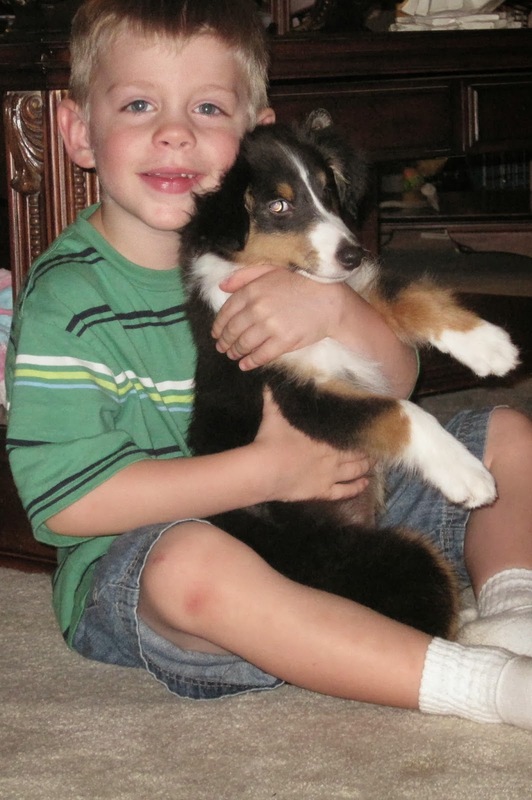 His sweet, silly personality made you love and adore him and see a different puppy. Mom, on the other hand, rounded the corner and saw him for the first time. She immediately declared that he was the ugliest little puppy she believed she’d ever seen. Poor little Barney! She was expecting a big fluffy ball of fur like Cotton, an American Eskimo Dog, was. I saw a picture of Barney from his puppy days on Facebook this morning. I hope I can find it to post here because the poor boy was really gangly! The angle of the camera doesn’t help! Little Man looks like he’s all head and only a little bitty body! I just want to grab that little puppy up and give him a big hug now!!! A lot of my friends have new pups this year. Seeing them hasn’t really made me want a puppy all that badly. Seeing pictures of my own Barney Boy from a few years back, though, is really giving me puppy fever!!! And lots of big, big smiles! Barney has been through so much with me. I had only had him for three weeks when we learned that our three grandkids, aged 10 months, 3 years, and 8 years at that time, were coming to live with us. CPS had removed them from their home and, at least at first, it seemed Robert and I were going to become parents again until the kids were full grown. I only had one child when I was young … getting three all of a sudden and under such circumstances was traumatic, to say the least. Poor little Barney didn’t get nearly as much attention as he would have under different conditions. Well, that’s not entirely true. 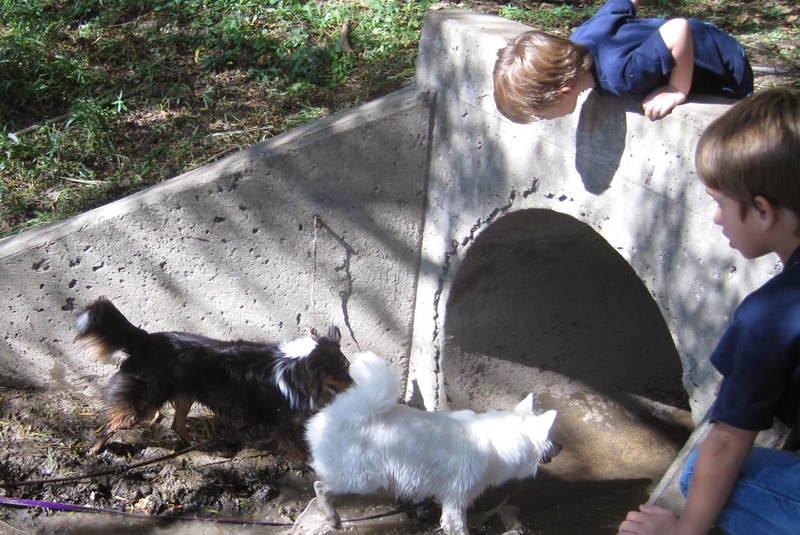 He got attention from the kids and from me … but it was different attention than I envisioned when I got him. The good news is that he loves kids, especially the three grandsons, unequivocally. I’m sure that growing up with the kids influenced that love greatly. But we missed some early training opportunities that I see my friends offer to their young pups. I’m not sure it really stunted him much though. He’s well-behaved and a fine little agility dog. The kids lived with us for 5-1/2 months before the judge allowed them to go back home. So much of my time and effort was focused on taking care of them that I feel like I missed Barney’s puppyhood. I barely remember it. Those months are a daze in so many ways! As soon as the kids got to go back home, Barney and I threw ourselves into training. Little Man was fabulous. If you asked it of him, he gave it. He still does. What a dog! We started training every chance we got. We went out to the DAWG (Dallas Agility Working Group) field twice a week and one time a week, Barney was in pre-agility and then beginner agility classes. We both love agility and spending the time together. Cotton was along for the DAWG training. She loves agility, too. Sometimes. When it suits her! As soon as he turned 18 months, Barney started competing in several different agility venues: USDAA, ASCA, and NADAC. We were gone nearly every weekend and, no matter the venue, the little guy turned in a stunning performance. He qualified in nearly every run he ran. We had so much fun. So.Much.Fun! We added AKC to our list of venues because there were a few weekends when we couldn’t compete in our favored venues. Addicted to agility! That was me, for sure. And Barney loved every minute of it, too! Then, in October 2012, the bottom fell out of my world. 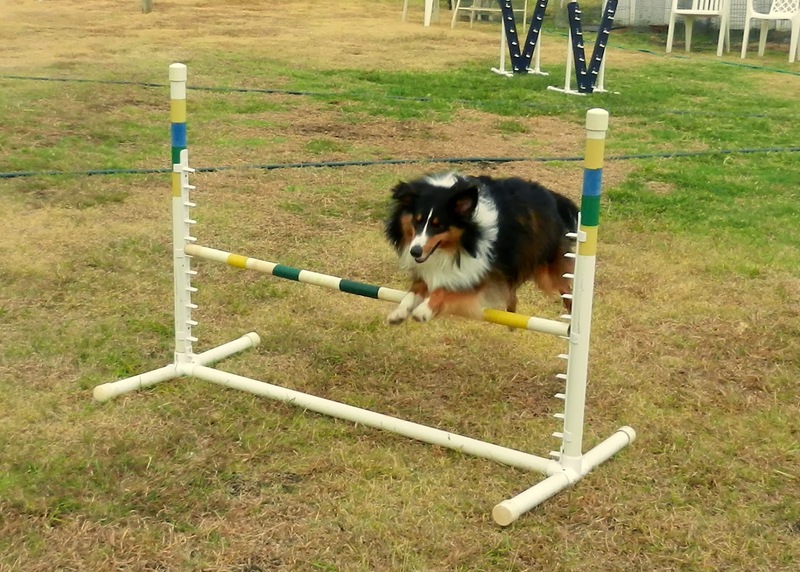 Forget the fact that I was competing in agility every weekend and going to class, by then, four times a week. Forget that I was happier and in better shape than I can remember being (other than being slightly overweight from having quit smoking and going through menopause without the benefits of hormone treatments). Cancer didn’t care. Barney, Cotton and I continued to go to class and trials while I underwent all sorts of tests and we waited to hear the final diagnosis. We even continued to go to class and trials after the word came that I had Stage IV lung cancer. But, once I started chemo, all bets were off. I didn’t have the stamina to go to class at night after working all day even when I wasn’t sick, deathly sick, from the chemo treatments. If I wasn’t nauseous, I was still so exhausted that asking my legs to carry me very short distances (like from the 15 feet or so from the couch to the refrigerator) was an accomplishment. As badly as I wanted to keep playing, it was physically and mentally impossible. Well, nearly. Ed Scharringhausen holds Run As One NADAC agility trials in this area once a month except during the hottest months of the summer. He and his other half, Cathy, are as supportive of me and the challenges I face with this disease as any two people I know have been. Despite not going to class, Barney and I have managed to go, at least for a few hours, to quite a few Run as One trials since I was diagnosed with cancer. And little Barney just keeps on keeping on! We’ve reached a point on one of the events, Chances, where the dog has to work a great distance from you, that we are not going to qualify without more training. Otherwise, though, Barney is at least as likely to earn a qualifying score as not. He gives his all each and every time we step to the line. But, Barney is more, so much more, than just my little agility teammate. I’ve posted this picture a time or two before, but in my mind’s eye, it is how I see my little boy much of the time. I was so sick after one of my first chemo treatments. 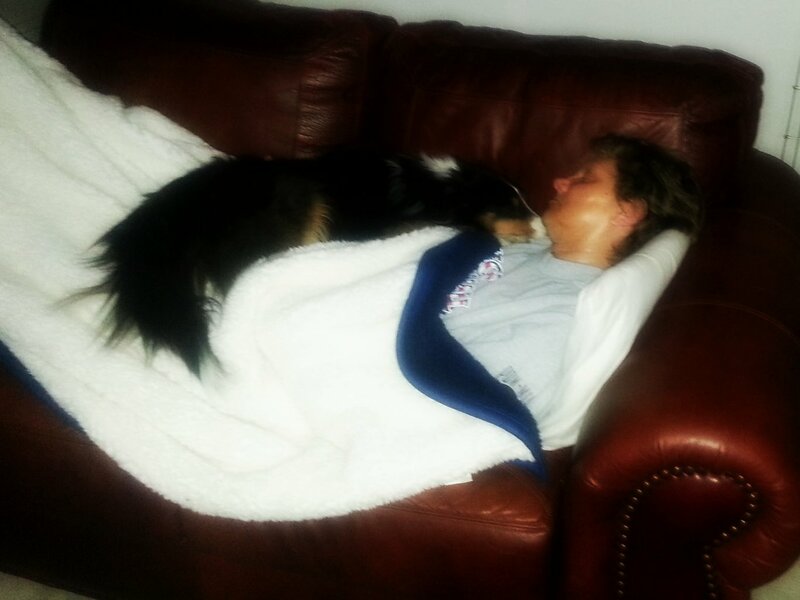 My boy was right there with me … he has never before or since been so willing to stay with me (on me) for so long as he was during the time that I was the absolute sickest … such a comforter!!! I dearly love my Cotton Girl. One of these days, I’ll give her a post! To go on and on about Barney doesn’t diminish how much I adore Cotton, but she’s a totally different dog than Barney. Barney is my caregiver and my little shadow. My sensitive, loving little man. I am, every single solitary day, so very grateful that Mr. Barney was brought into this world on February 7, 2010 and that he came home with me a few weeks later! Happy birthday, Little Man!!! I hope we get to share many, many, MANY more together!!!! Posted on February 8, 2014 January 3, 2018 Categories agility, cancer, chemo, lung cancer, stage IVTags American Eskimo Dog, NADAC, Run As One, sheltieLeave a comment on Happy Birthday, Barney Boy!